Looking for a monitor for your new MacBook Pro? Here’s a look of 8 good options with USB Type-C.
About a year ago Apple exited the display monitor market pointing users towards third-party options. This left a variety of Mac users frustrated with what they felt were less-than-Mac quality options. If you’re in that boat, here’s a look at a few quality monitors that are compatible with the MacBook Pro through USB Type-C or a variety of other connections. Looking for a good display option for your MacBook Pro or Mini? Here are a few monitors we recommend. This monitor recently moved to the top of my list. The 27UK850-W gives you a 27 inch IPS display, HDR10 compatibility, USB Type-C, FreeSync, and 99% sRGB. It's certainly not cheap at around $650, but it is reasonable for what you're getting. I also found it to be an especially good option for my MacBook Pro and power delivery. So far, it's worked very well. The monitor I received also had very little backlight bleed and the colors are very good. 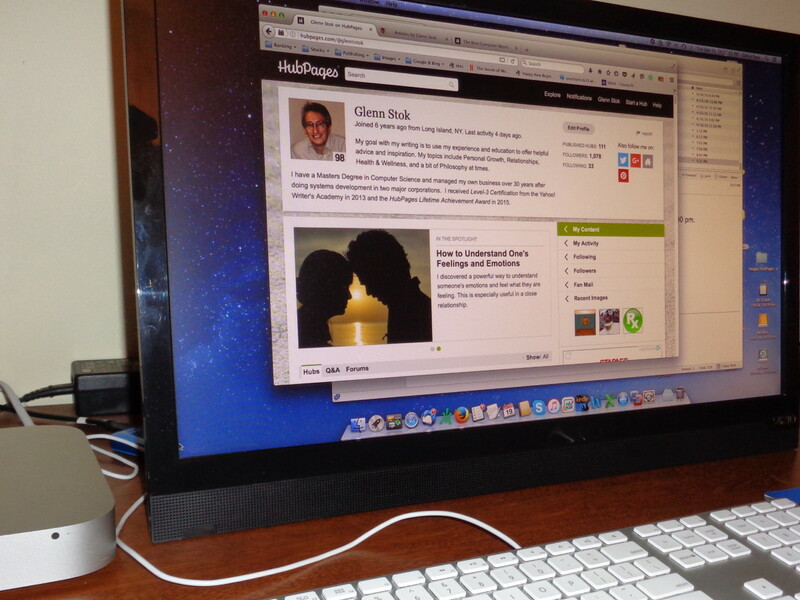 In fact, I don't miss my old Thunderbolt display at all. HDR10 has been fantastic for anything that actually has it. It provides a higher level of contrast between the light and dark images you see ultimately doing a lot more with the pixels you already have. For me, I use this monitor for gaming as well. You can hook it into your console or simply play games on it with your MacBook. I use a PC when I game and an AMD video card so having FreeSync is a nice feature as well. For a 27" IPS display with HDR10, functioning USB-C with adequate power delivery for my MacBook Pro, and 4k I feel the $650 price range is very reasonable. In addition, the LG 27UK850-W is a worthwhile upgrade over the previous generation LG 27UD88 which didn't have HDR10. If you have a choice between the two, be sure to go with the newer version. If you’re looking for a 4k AH-IPS monitor with a 27-inch screen, I like the Asus Designo MX27UC. It looks great, doesn't cost a fortune, has great color, and is accurate as well. For the MacBook Pro, you'll get 4k and 60Hz over its HDMI port as well as USB-C. In terms of design, the Designo looks great on your desk with an almost borderless look that matches the quality look you expect to go along with your Apple products. 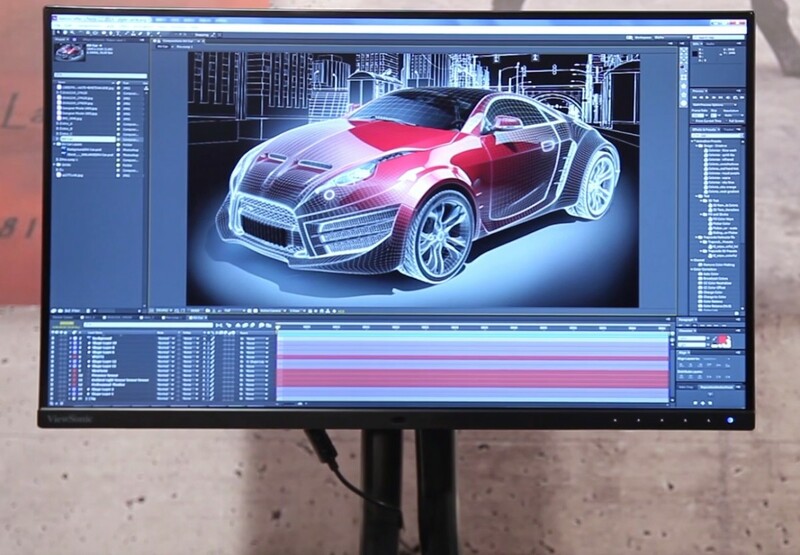 For display, you’re getting a 27″ AH-IPS 3840×2160 display with 5ms response time and 1.07 billion display colors. On the color saturation front, the Designo has a wide gamut which covers 100% sRGB. Connectivity is good with the USB Type-C Port as previously mentioned along with DisplayPort, HDMI 2.0, 2 x USB 3.0 ports, and a headphone jack. Overall, the Designo MX27UC is a very good buy at $600 and has the up-to-date specs to last you for many years to come. It’s a bit more expensive than the Acer model we'll mention below, but its still running about 60% of the price of Apple’s Thunderbolt Display and doesn't suffer from the same connectivity issues. The MX27UC is not to be confused with the previous version Asus MX27UQ which does not come with a USB Type-C Port. Sharp with great colors and a good contrast ratio. At just around $400 the Dell UltraThin S2718D is one of my favorite USB Type-C monitors on the market. 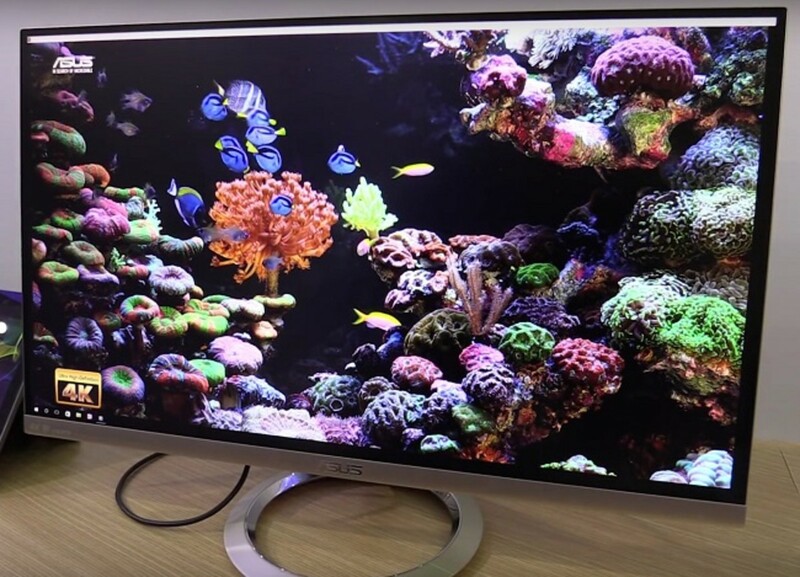 It’s a 2560×1440 resolution display that runs at 60Hz with an IPS display at up to 99% sRGB. So, it’s not a professional monitor and only goes to 1440p. That being said, I was impressed with its color, grayscale, and design. 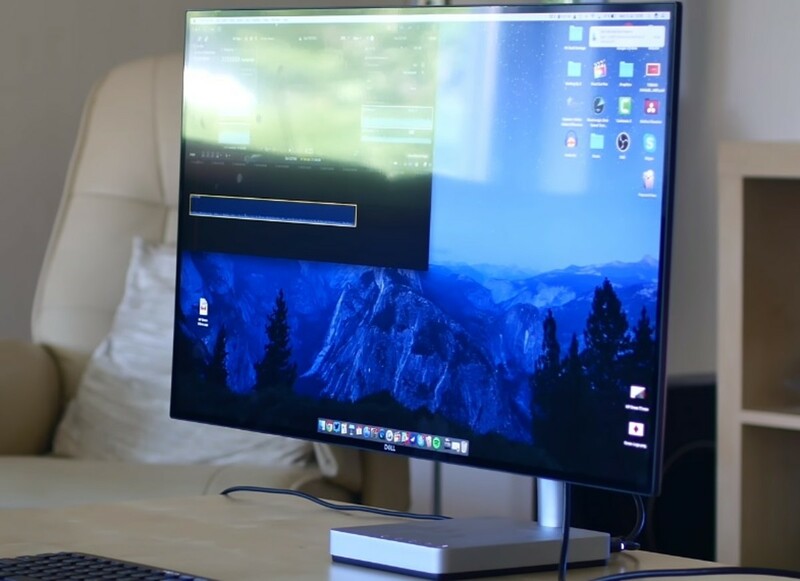 The display itself looks fantastic and is very bright at 400 nits – albeit slightly less so than an iMac would be. One of its most stand out features is its nearly bezel-less design along with a thickness of just 6.9mm. It’s truly one of the best-looking monitors that we’ve seen with its silver and black design and ultra-thin screen. There are no VESA mounting holes in the back so if you’re planning to put this on your wall, you might want to look elsewhere. The monitor tilts and swivels very easily; however, there is no additional height adjustment. Also, it’s not 4k, which may be a dealbreaker for some. That being said, I really like it for what it is and it’s a fantastic everyday use monitor for those who can live with 99% sRGB. As I mentioned previously it’s also one of the better value monitors on this list at just around $400. 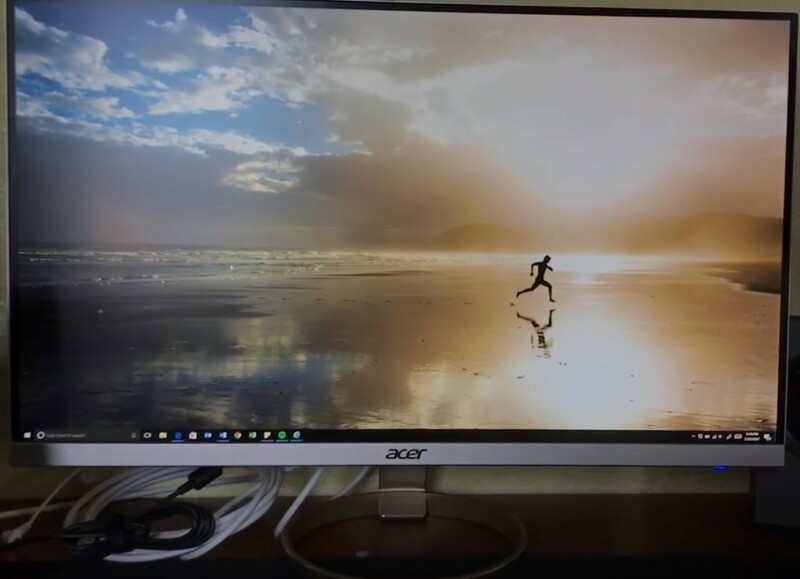 If you’re looking for a color-accurate IPS monitor with USB Type-C and a 1440p resolution, the Acer H277HU gives you good quality along with amazing value. This 27″ IPS display not only gives you the design you’re looking for, the screen is bright, sharp, and expansive. Connections for the H277HU go beyond just the USB type-C with HDMI, 2 USB 3.0 Type-A ports, as well as DisplayPort. So it’s easy to switch to other devices like your Apple TV. Ultimately this is a great monitor. Using the USB Type-C port you’ll be able to charge your laptop while using the monitor. There were issues with the MacBook Pro 2016 touch bar in charging while connecting but these have been worked out with the latest update of MacOS Sierra. So, if you end up going with this monitor, be sure you’re up-to-date. Colors, black, and whites are rich and vibrant but appear slightly different than on Apple displays. 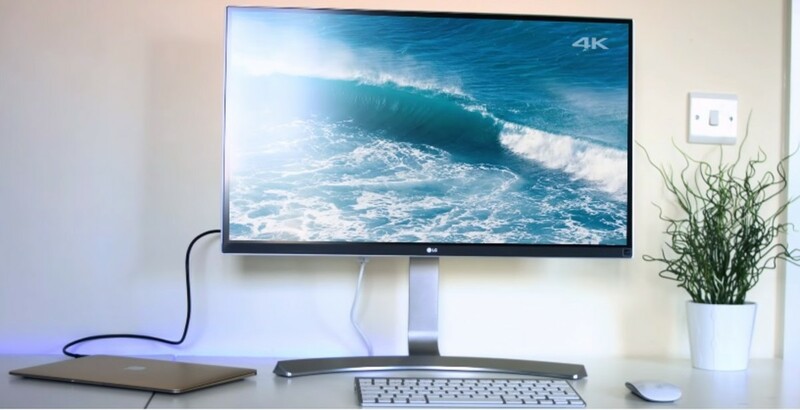 LG Class UltraFine 27″ 5k and 21.5″ Type-C 4k Monitors – What’s the difference? Apple partnered with LG to make these two new USB Type-C displays. So, if you’re not familiar with them, what’s the difference between the two? Although they share much of the same profile, they vary quite a lot. Although they share much of the same profile, they vary quite a lot. First of all the price of the 27″ 5k Display is around $1300 with the 21.5″ 4k display coming in at just around $700. In terms of resolution, the 5k monitor has a 5120 x 2880 resolution while the 21.5-inch monitor has the 4k 4096 x 2304 resolution. Both tout a 99% DCI-P3 wide color gamut. Both panels are IPS and 8 bit with the 27″ version of this display adding A-FRC for 8+2 10 bit color support. 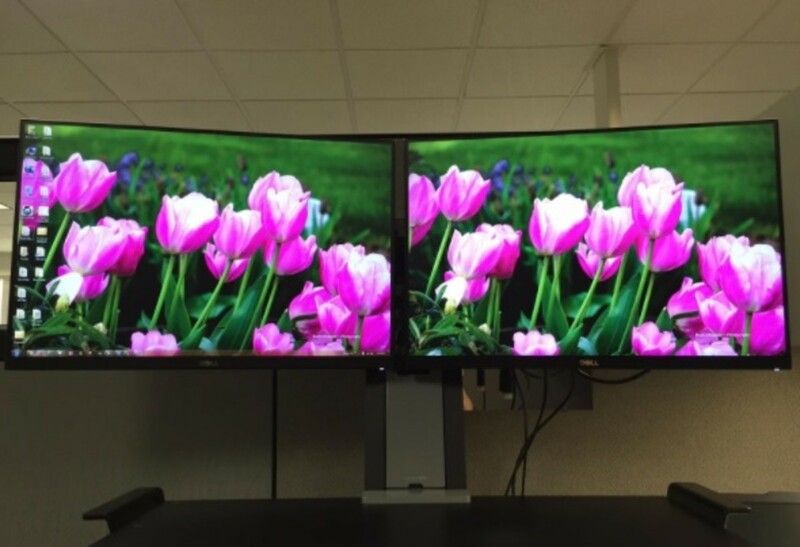 In terms of specifications, these monitors also have the same 500 nits brightness, 1200:1 contrast ratio, 178-degree viewing angles, 12 ms response time, and use an anti-glare surface treatment. Both monitors include a single upstream USB-C and use LG standard speakers with a removable stand that has tilt and height adjustment. They also include ambient light sensors, 3 downstream USB-C, and HDCP1.4 / 2.2. Only the 27″ version also includes a mic and camera. Both monitors also include a 1-year parts and labor warranty. Overall both of these monitors are a bit expensive for what they have to offer. That being said you get the look, feel, and ease-of-use that comes with an Apple-partnered product. The picture quality is fantastic, the accuracy is good, and the ease-of-use gets an A+ in my book. Specifically, the 27″ 5k UltraFine monitor gives you 14.7 million pixels to work with and that feels just about right. 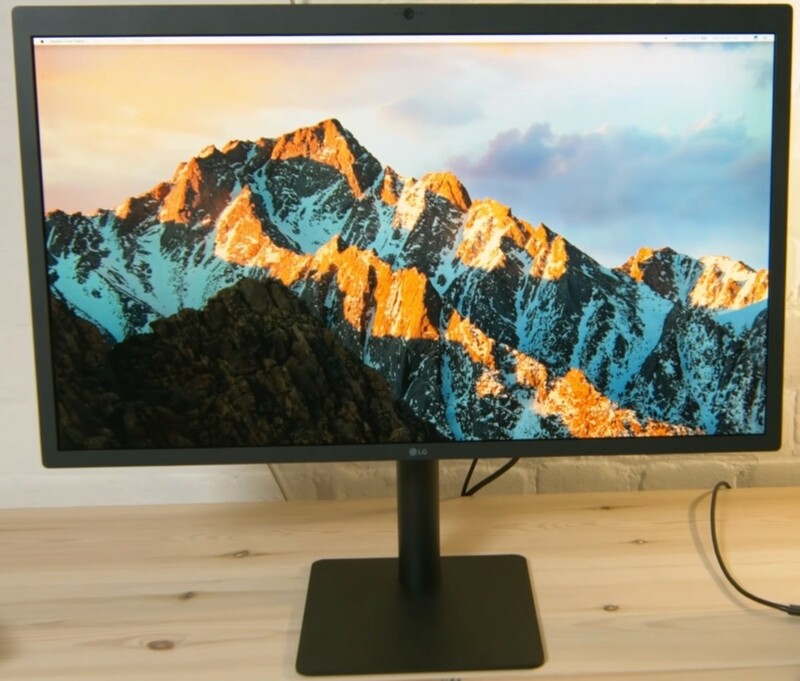 If you’re looking for a color accurate monitor for your MacBook Pro with USB Type-C, the Viewsonic VP2771 27″ IPS should be at the top of your list along with some of the other monitors on this page. Connectivity is generous with HDMI 1.4, DisplayPort, Mini DisplayPort, DisplayPort Out, USB 3.1 Type-C, and USB 3.1 Type A or B. The display itself comes with S4GB, Rec.709, SMPTE-C, DICOM-SIM, and iPhone presets. In terms of accuracy, the VP2771 comes well-calibrated out of the box with a Delta E ≤ which has been verified. Overall this is a great monitor if you’re looking for a color accurate 1440p option that can cover the Rec.709/sRGB space. It doesn’t cover the Adobe RGB Gamut even though it’s sold as a professional monitor; however, you’re not paying for that here either. The big thing here is the factory calibration. Yes, you could certainly do better if you use the Calibration kit from Viewsonic; however, you may or may not need that. *Keep in mind you'll need a USB-C cable that charges. So, be sure to look for one that is compatible with Thunderbolt! You’ve probably seen LG’s UltraFine 5k and 4k Display on the Apple website. That being said, they actually have another Type-C option available in the LG 4k UHD 27UD88-W. 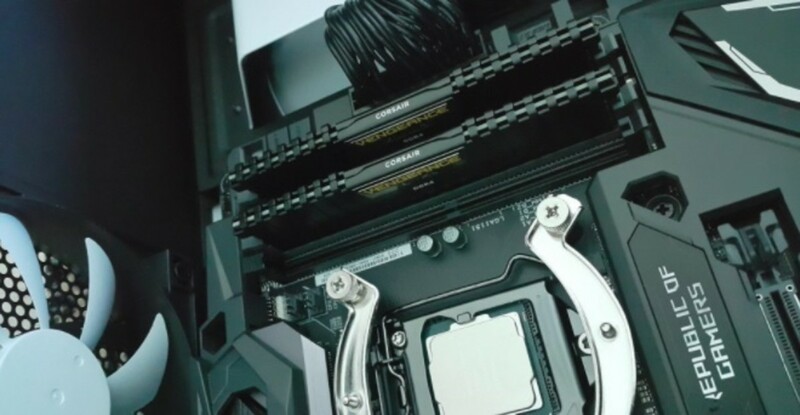 This is a solid choice for gamers and includes AMD’s FreeSync technology. The design of the 27UD88 is a huge plus with a very Mac-worthy white chassis and curved stand. Connectivity for the monitor includes USB Type-C, 2 x USB 2.0, a DisplayPort, as well as 2 HDMI ports. The monitor is a bit pricey and does give you a good blend of brightness and contrast albeit not as great as some other monitors I’ve seen. You do get 99% sRGB coverage here which may be enough for some along with 8-bit color with Frame-rate-control up to 1.07 billion. You do get a fantastic calibration out of the box with the monitor at 1.8 Delta E and as good as 1.4 with an additional calibration. 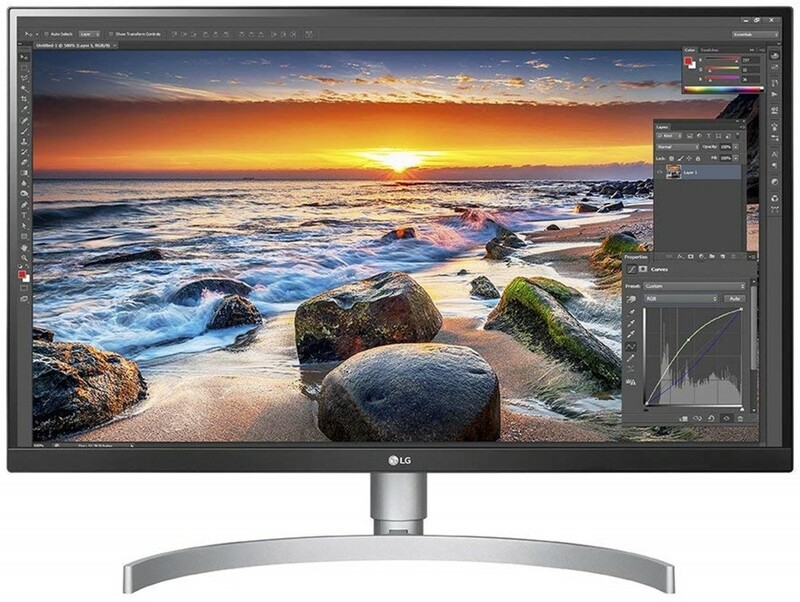 Overall, you pay a bit more here for the elegance of the LG 27UD88-W and get a monitor that performs well in a wide variety of scenarios. Dell UltraSharp U2415 – No USB Type-C No Problem? If you don’t have a huge budget but still want something attractive and color accurate, take a look at Dell’s UltraSharp U2415. I currently have a triple monitor setup that includes two of these. I enjoy the inexpensive price tag, the bright color, and wide viewing angles. The U2415 has a lot of convenient features like tilt, swivel, pivot, and height adjustment and has a thin bezel for a seamless feel. Setup for MacBooks prior to 2016 is easy. However, for 2016 you’ll need to go MacBook Pro Thunderbolt 3 out port to Thunderbolt 3 to DisplayPort adapter to DisplayPort out to DisplayPort cable U2415 in. So, it’s a bit of a risk if you’re concerned with all of those connections. That being said, this is one of the better values in terms of accuracy and what you can get on the market. So, it still seems worth adding here. However, for 2016 you’ll need to go MacBook Pro Thunderbolt 3 out port to Thunderbolt 3 to DisplayPort adapter to DisplayPort out to DisplayPort cable U2415 in. So, it’s a bit of a risk if you’re concerned with all of those connections. That being said, this is one of the better values in terms of accuracy and what you can get on the market. So, it still seems worth adding here. The U2415 also gives you a little bit more screen real estate to work with featuring a 1920 x 1200 resolution at up to 60Hz. This IPS panel also has a 24″ anti-glare coat 3H screen with wide 178 degree viewing angles. Overall, I still like the U2415 a lot for those who are looking for a value play. On the other hand, you might need to be an adapter wizard to get exactly what you’re looking for. Does My Monitor have to have USB Type-C? The short answer to this is no. That being said, you’ll need to purchase a separate dongle that works with your current connection and USB Type-C. And if you’re willing to go this route, you might be able to get a better overall value for your money. However, we’re betting that the majority of you would prefer to go with the newer technology. A lot of you have expressed concern about using 4k with the MacBook Pro. 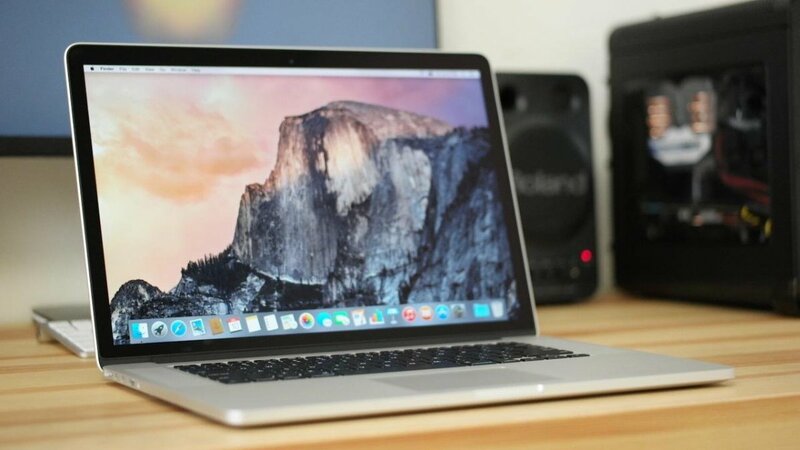 You can use a 4k monitor with the MacBook Pro; however, depending upon your monitor’s ports, the type of adapter you have, and the year of your MacBook Pro the refresh rate and other options may be limited. 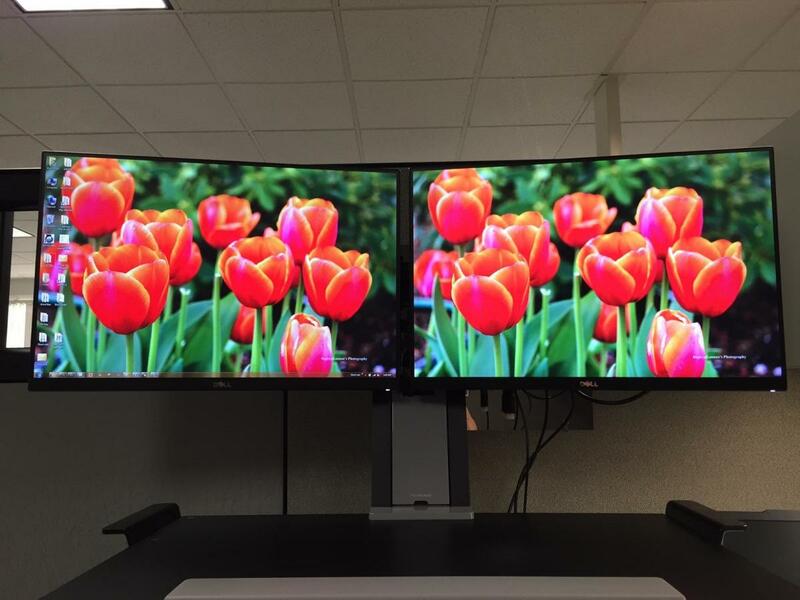 If you’d like to know more about displays and configurations, we recommend this support page. Now let's take a look at a few monitors that I feel give you the best overall value. Keep in mind that some of these have USB Type-C and others may require an adapter for use with your New MacBook or MacBook Pro. Considering there are still very few monitors available with Type-C, we felt that this was the best option. 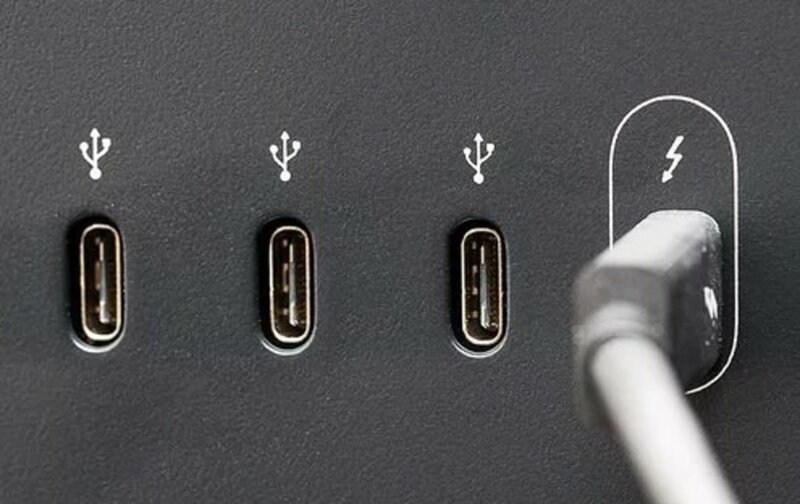 USB Type-C is the only connector you’ll find on the latest MacBook Pro. All devices can connect to this port. However, if you have a different port on your device, you’ll need an adapter. This includes devices that connect through HDMI, USB 2.0, 3,0, Ethernet, and SD cards. This version of USB 3.1 is faster and can handle even more power than other versions. In addition, it’s capable of 10 gigabits per second, and a 100-watt power delivery making it faster to transfer data and charge. This version of USB 3.1 is faster and can handle even more power than other versions. In addition, it’s capable of 10 gigabits per second, and a 100-watt power delivery making it faster to transfer data and charge your MacBook.